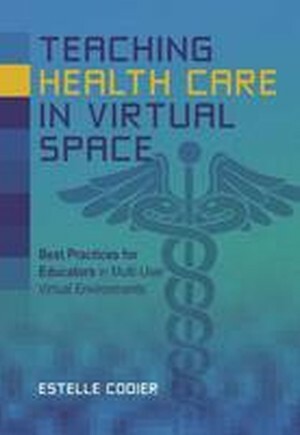 Teaching Health Care in Virtual Space is the first "how-to" manual for health educators on the instructional use of three-dimensional, computer-generated virtual environments that can be inhabited simultaneously by many participants; commonly called "multi-user virtual learning environments" or MUVE. Based on her experience supervising more than 400 learning activities in Second Life-as of 2014, the largest public (free) MUVE-Dr. Estelle Codier has written a step-by-step handbook for novice and experienced MUVE teachers alike. The book provides those new to virtual teaching with specific steps to assess their own instructional readiness, guidance for assessing student and class readiness, as well as detailed descriptions of problem prevention and solutions. The text is accompanied by lively case studies of both success and failure in virtual learning environments. Inspiring stories of student learning illustrate the power of MUVE to transform health care education. This innovative handbook presents an extended discussion of the pedagogical advantages for learning in multi-user virtual environments, along with a history of learning in Second Life. The text includes an appendix of supporting materials for MUVE learning activities: evaluation grids, grading matrices, syllabus descriptions, and detailed orientation materials for both faculty and students. While the sample learning activities were designed for nurses, instructors in other disciplines could easily adapt them for use in any MUVE setting.